But Spokes also receives comments about inconsiderate path use, both walking and cycling. Two common complaints are people cycling too fast and dogs not under control – both of which can cause fright and even crashes. The key to sharing paths successfully is for everyone to understand and be considerate to one another. 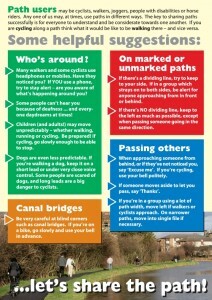 If you are cycling along a path, think what it’s like to be walking – and vice versa. People aren’t born as separate categories of ‘cyclists’ and ‘walkers’ – any one of us may at different times use paths in different ways and for different purposes. Over the years Spokes has taken several initiatives to help foster thought and consideration by all path users – though it must be remembered that the 1200 Spokes members probably comprise only 2% or less of all the people in Edinburgh and Lothian who use a bike sometimes, and only a tiny % of those who walk, so our influence is limited! 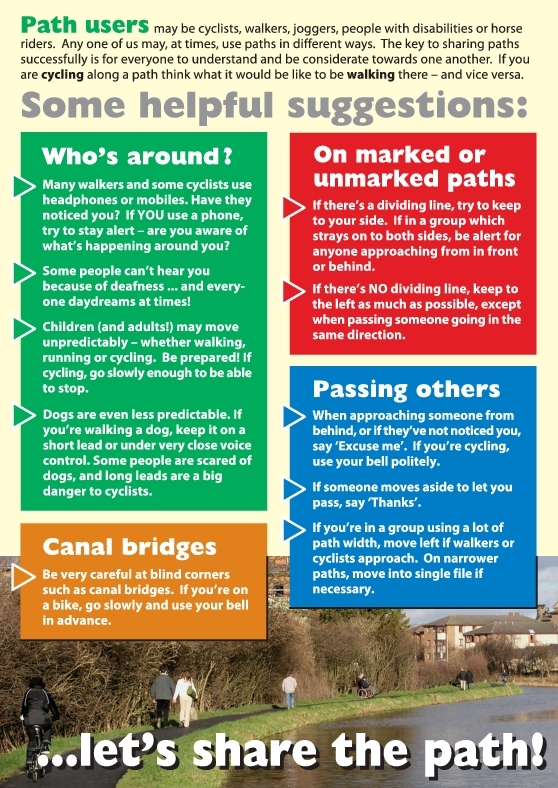 Spokes has just published a new shared-paths leaflet, which is now online in two versions – as a result of considerable thought and discussion. The front of the two versions is identical. However, on the reverse, one takes a traditional ‘User-Based’ approach, with separate panels for when you are walking and when you are cycling; whilst the other uses an innovative ‘Topic-based’ approach, with panels based on topics such as “passing each other” applicable to both walkers and cyclists. 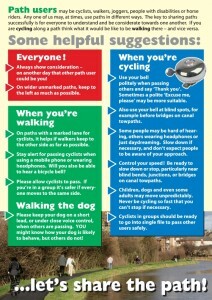 You can download and print pdf’s of both versions on our Considerate Cycling page. The topic-based leaflet version will be printed as a pull-out in all 12,000 copies of Spokes Bulletin 114 – the Bulletin will be available in late October in bike shops, libraries, etc for non-members of Spokes, and is also distributed to many hundreds of decision-makers. The topic-based leaflet will also be printed as a separate A5 flyer, for use at stalls and by or with other community organisations. [It would be uneconomical for us to print both versions]. Here, for comparison, are lower-resolution versions of both page 2’s, showing the user-based and topic-based approaches. 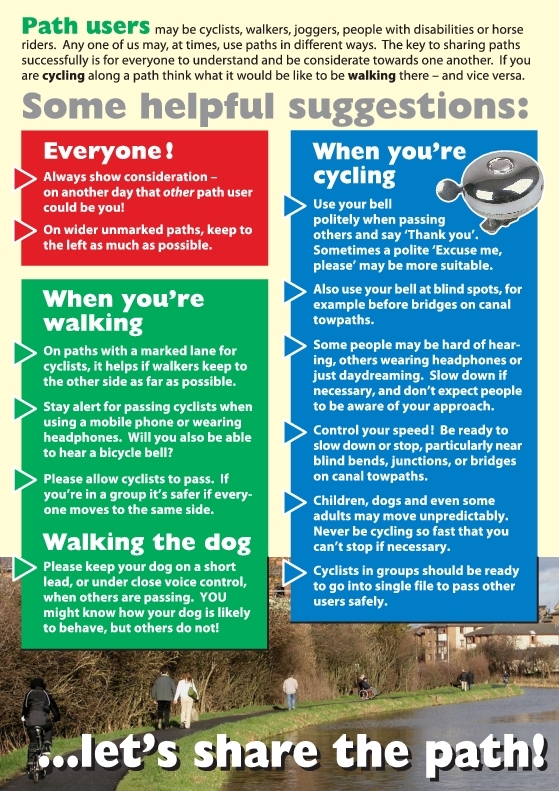 The more traditional User-based leaflet perhaps gets the message over more directly, with separate sections addressed to walkers and to cyclists – but some people regard that as a bit ‘preachy’ especially as the ‘advice’ to cyclists is longer than that to walkers. However the leaflet helps ameliorate that problem by recognising that people can be both walkers and cyclists on differing occasions. So rather than a panel headed “Walkers” the panel is called “When you’re walking” and ditto for cycling. The Topic-based leaflet uses an innovative approach – which we’ve not seen elsewhere – by having every panel applicable to both walking and cycling. This avoids the risk of being seen as more preachy towards one category than the other. It also allows more points to be covered without increasing the length of text. For example, in the user-based format cyclists are reminded that some walkers may move unpredictably but walkers are not reminded that some cyclists may move unpredictably – this would need another paragraph in the ‘walking’ section, lengthening it too much. However in the topic-based format this is all covered in the one paragraph. Similarly, a warning about headphones is covered by one paragraph in the topic-based format, but needs separate ‘walking’ and ‘cycling’ entries in the user-based format. Spokes welcomes comments on these shared-paths materials. We are also very happy for the pdf’s to be downloaded and used by other organisations. You are also welcome to use the ideas for designing your own materials, but if so we ask that Spokes is credited and our website referenced.